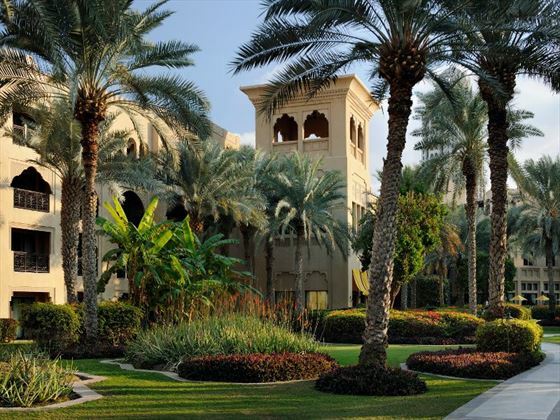 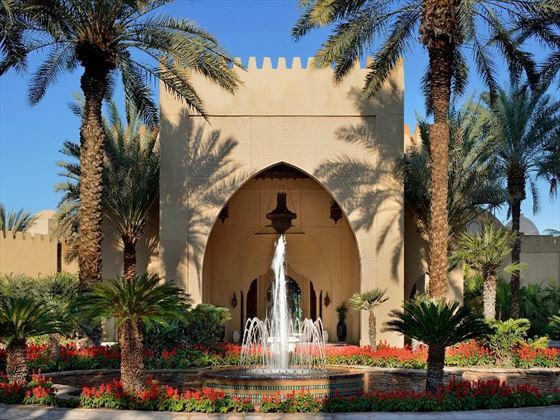 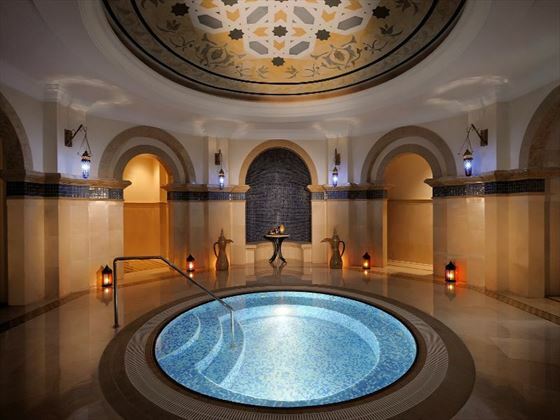 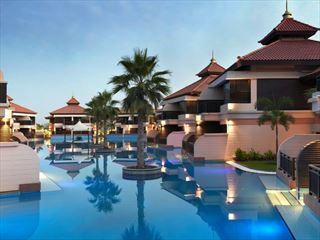 One&Only Royal Mirage offers sophisticated chic and high quality comfort on its own private beach. 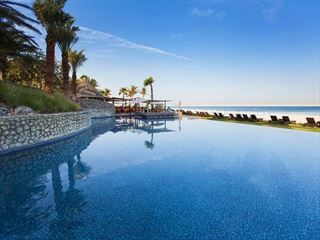 All rooms are sea-facing offering at least partial views of the Persian Gulf. 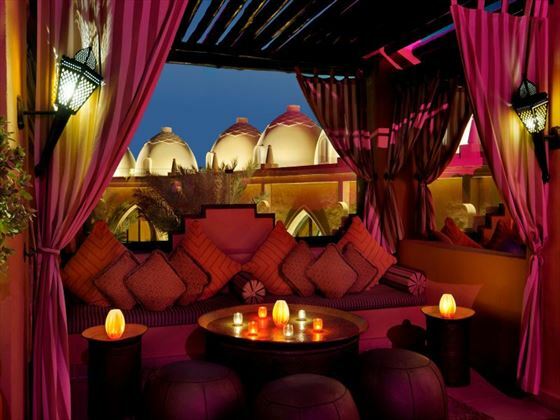 Arabian Court is the main section of the One&Only Royal Mirage complex, and places you right at the heart of the action. 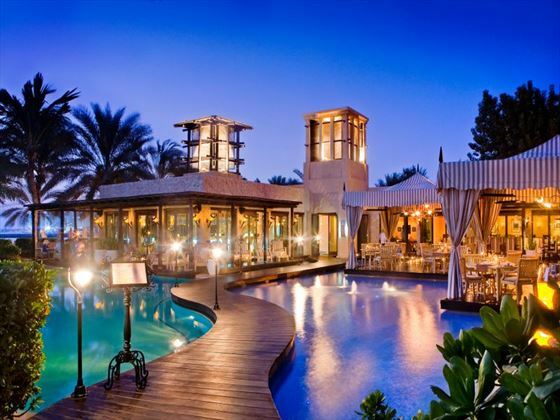 Top Tip: Celebrities Restaurant is our pick of the dining options – offering classic European dishes with a wonderful modern twist, there’s also a very friendly yet efficient atmosphere. 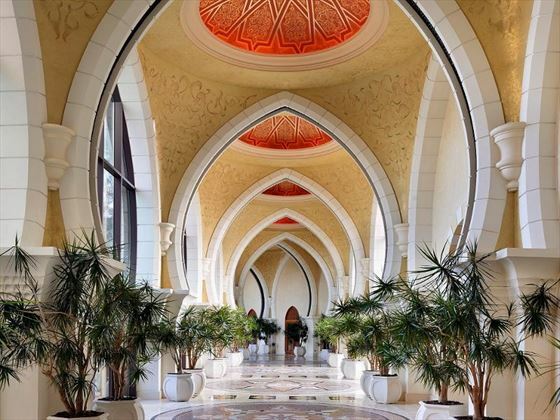 Inspired by the magic of Arabia, each room features carved arches, colorful mosaics and dramatic artwork. 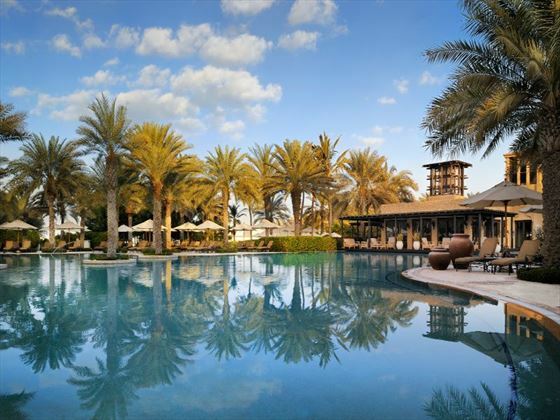 The bathrooms are adorned with wood, marble and slate and feature a wet area with overhead and handheld showers with a granite bench, separate toilet and bidet, individual vanity with under-shelf cupboards and separate bath with handheld shower. 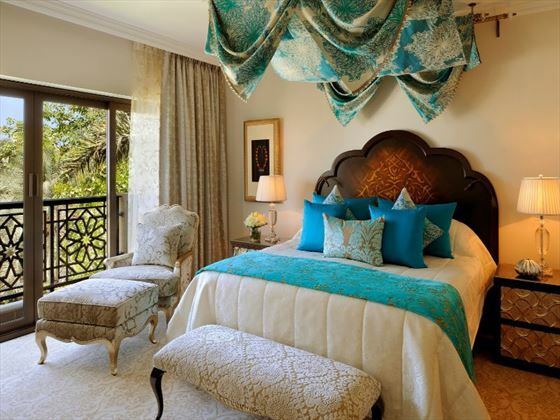 Furnishings are rich with intricate patterns reflecting the warmth and comfort of the Orient. 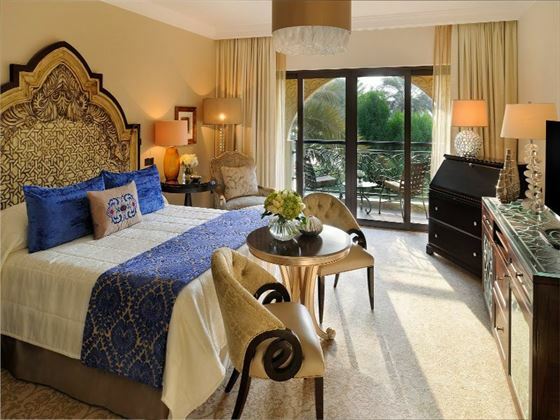 Enhanced technology features a 40’’ full HD LCD television, DVD player, iPod docking station and high-speed Internet access. 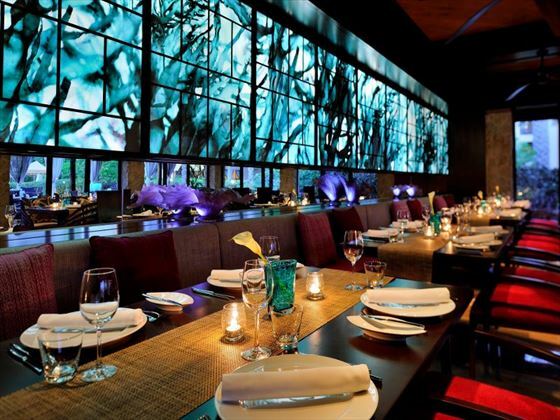 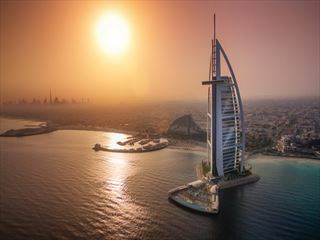 The majesty of the Arabian Court features various culinary options including all-day dining with a distinctive show kitchen at The Rotisserie, Indo-European flavors at the superbly chic Nina, and poolside and beachfront dining with an Asian twist at Eauzone. 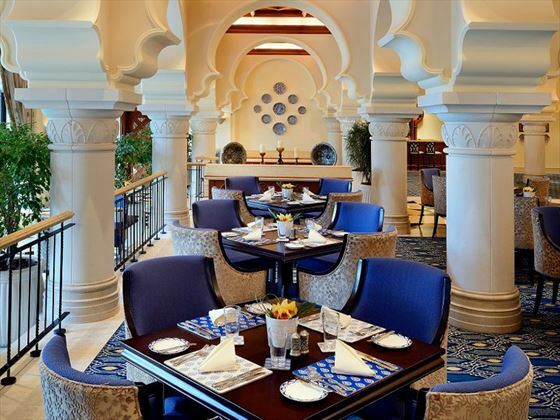 Dining within the walls of The Palace offers a taste of the Mediterranean at Olives, truly Moroccan influences at Tagine, a creative range of international cuisine at Celebrities, and sumptuous seafood and grills at Beach Bar & Grill.